ThumbnailImage is a custom WPF control I've created to use in Comicster. It saves a local, resized version of an image given by a URI and uses the local copy instead of the online one. Those two properties are the only ones that need to be set. CacheId, a string, represents the identity of the image and is used as a filename when it's saved locally. UriSource, as the name implies, is a URI that points to the image online. In this post I'll outline some of the features of the ThumbnailImage control. Since you've just set "d:\" as the default value for the CacheFolder property, all ThumbnailImage instances will save their thumbnails to that directory. Note the use of the pack URI syntax there, since FallbackSource is also defined as a URI and will be downloaded and resized just like other images. Unlike the aforementioned properties, ThumbnailWidth has a default value and can't be overwritten at the DependencyProperty level. 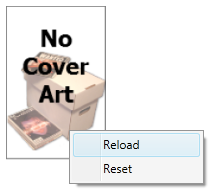 The ThumbnailImage control has a read-only property called IsReloading which you can use to see if the image specified in UriSource is currently being downloaded. This is handy if you'd like the control to display some sort of feedback to the user while it's reloading. You can do this in a global style, perhaps in your App.xaml file. The ThumbnailImage class keeps a private static ConcurrentDictionary that it uses to track other instances of the control with the same CacheId. That way if you start one instance reloading, other instances will be notified and set their IsReloading property accordingly. When one instance updates, all of them will update. The ThumbnailImage control's source code is part of Comicster right now, but you can check it out in Comicster's BitBucket repository. It's in the "Comicster.Controls" project. If you can improve the control, let me know by commenting here or sending me a pull request!